Ballerina Dominika Egorova gets recruited to join a Russian intelligence service, and her first mission threatens to unravel the security of both Russia and the USA. Jennifer Lawrence and director Francis “No Relation” Lawrence teamed for three of the four Hunger Games films. The two reunite for 2018’s spy thriller Red Sparrow. Dominika Egorova (Jennifer Lawrence) earns fame as a prima ballerina for the Bolshoi Ballet. 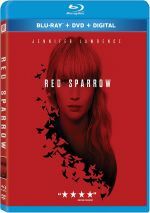 After a gruesome leg injury forces her retirement, a secret Russian spy organization recruits her and sends her to “Sparrow School”, where she learns the tricks of the trade. After she completes this rigorous training, Dominika emerges as a top-notch operative. Her work sends her on a collision course with CIA agent Nate Nash (Joel Edgerton) and forces her to make a variety of difficult choices. Not long ago, Hollywood banked on “A”-list actors to sell movies, but those days seem largely done. Even Dwayne Johnson – probably the biggest movie star circa 2018 – suffers prominent flops, as 2017’s Baywatch demonstrated. Many regard Lawrence as the most bankable female actor in the business today, but recent years show the limits of “star appeal”. Paired with fellow “name actor” Chris Pratt, 2016’s Passengers sputtered to passable but disappointing box office returns, and Sparrow fared worse. Granted, Sparrow offers a “hard R”-rated thriller, so I wouldn’t expect it to amass the mega-profits of the Hunger Games films. Still, one would think Lawrence’s presence would give the film an edge to allow it to earn more than $46 million in the US. Now that I’ve seen Sparrow, I feel surprised it took in as much money as it did. Sluggish and barely coherent, the movie disappoints. In a logical cinematic world, Sparrow would follow a basic “origin story” framework. In this situation, it would spend about half its time with an introduction to Dominika and her training, and the second half would put her into action as an agent. Instead, Sparrow muddies the waters. Sure, it gives us a lot of the expected “origin” tale, but it includes plot points connected to Nash well before Dominika meets him. This doesn’t work, mainly because Sparrow fails to blend the various narrative elements in a workable manner. It jumps from one story area to another with little coherence and it doesn’t mesh smoothly. Even after Dominika and Nash formally meet, the film can’t provide a functioning story. It tosses out spy-based tidbits and other moments of intrigue in a vaguely random way, so it doesn’t move in a forward manner or connect with the audience. Sparrow comes with an excellent cast, as in addition to Lawrence and Edgerton, we find talents like Jeremy Irons, Charlotte Rampling, Mary-Louise Parker, Joely Richardson and others. The film promptly wastes each and every one of them. Lawrence never gets a handle on her Russian accent, and though she looks great, she fails to bring the needed depth and menace to her role. The others essentially punch the clock and lack real investment in their characters – except perhaps for Rampling, who makes her short time as the Sparrows’ icy teacher fairly memorable. While the actors don’t add much, the main problem remains the loosely constructed narrative and the aimless direction. Francis Lawrence creates a film without clarity, one that ambles from one plot point to another with little cohesion. The basic premise of Sparrow makes it mildly engaging for its first act, but the longer it runs, the less effective it becomes. A thriller with no real tension or suspense, this becomes a long, slow ride. 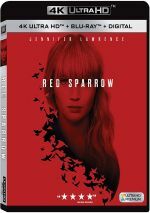 Red Sparrow appears in an aspect ratio of approximately 2.40:1 on this Blu-ray Disc. This became a positive presentation. Overall definition looked good. Though a few wide shots showed mild softness, the majority of the film appeared accurate and concise. I noticed no jagged edges or moiré effects, and edge haloes stayed absent. No print flaws cropped up either. Sparrow offered a pretty standard orange and teal palette. These choices seemed tedious, but within constraints, the colors looked fine. Blacks were dark and deep, and low-light shots showed good clarity and smoothness. I felt pleased with this fine image. Given its moderate action orientation, the film’s DTS-HD MA 7.1 opened up pretty well. Though the film didn’t include as many slam-bang set pieces as a typical action flick, it brought out some good sequences. When the track needed to expand during gun battles and the like, it used the full spectrum well. Elements were properly placed and moved about the setting in a convincing way. The surrounds contributed a nice sense of space and involvement. Music depicted positive stereo imaging and the entire presentation offered a good feeling of environment. Audio quality fared well. Speech was accurate and distinctive, without notable edginess or other issues. Music sounded full-blooded and rich, as the score was rendered nicely. Effects showed good range and definition. They demonstrated solid low-end and were impressive across the board. Ultimately, this was a positive track. The Blu-ray comes with a good array of extras, and we begin with an audio commentary from director Francis Lawrence. He provides a running, screen-specific look at the source novel and its adaptation, story/characters, cast and performances, sets and locations, effects, stunts/action, music and related areas. Overall, Lawrence delivers a pretty solid commentary. He covers the requisite array of subjects and does so in a lively, engaging way. All of this adds up to an informative chat. 10 Deleted Scenes take up a total of 12 minutes, 20 seconds. These tend to offer fairly minor character tidbits. Some of these expand exposition to a decent degree, but I can’t claim any of them seem memorable or significant. We can view these with or without commentary from Lawrence. He gives us specifics about the scenes and usually – but not always – tells us why they got cut. Lawrence’s notes largely prove useful. 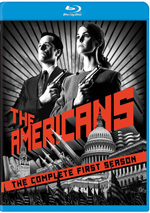 Six featurettes ensue, and these start with A New Cold War: Origination & Adaptation. It goes for 12 minutes, 42 seconds and includes info from Lawrence, novelist Jason Matthews, producer David Ready, screenwriter Justin Haythe, associate producer Cameron MacConomy, and actors Jennifer Lawrence, Jeremy Irons, and Sakina Jaffrey. “War” discusses the source novel and its adaptation, story and characters. “War” provides a solid examination of these areas and works better than most of its peers. Next comes the 15-minute, 21-second Agents Provocateurs: The Ensemble Cast. It features Francis Lawrence, Jennifer Lawrence, Irons, MacConomy, Ready, Rampling, Jaffrey, and actors Joel Edgerton, Matthias Schoenaerts, Bill Camp, and Charlotte Rampling. As expected, this one discusses the performers and their work. While we get a few insights, much of “Agents” devotes itself to praise for the actors, so don’t expect a lot of depth from it. With Tradecraft: Visual Authenticity, we find a 13-minute, 28-second piece that offers notes from Francis Lawrence, Edgerton, Ready, MacConomy, Jennifer Lawrence, Irons, Schoenaerts, costume designer Trish Summerville, and actor Thekla Reuten. Here we learn about photography and costumes, with a heavy emphasis on the latter domain. Those notes flesh out “Tradecraft” well and make it a useful program. Heart of the Tempest: On Location runs 10 minutes, 56 seconds and includes Francis Lawrence, Ready, MacConomy, Jennifer Lawrence, Rampling, production designer Maria Djurkovic, and Budapest location manager Ildiko Kemeny. “Heart” examines sets, location and production design. All of this adds up to another satisfying featurette. During the 12-minute, 12-second Welcome to Sparrow School: Ballet and Stunts, we find material from Francis Lawrence, Jennifer Lawrence, Edgerton, associate choreographer Kurt Froman, stunt coordinator Chris O’Hara, actor Sebastian Hulk and dance double Isabella Boylston. Like the title states, the reel details issues connected to the movie’s dancing and stunts. It combines the two domains to create another engaging piece. Finally, A Puzzle of Need: Post-Production lasts 14 minutes, eight seconds and delivers remarks from Francis Lawrence, Jennifer Lawrence, editor Alan Edward Bell, composer James Newton Howard and guest conductor Esa-Pekka Salonen. The show digs into editing, audio and music. It delivers a fairly informative program. A second disc gives us a DVD copy of Sparrow. It includes the commentary and the deleted scenes but it lacks all the featurettes. As much as I like Jennifer Lawrence, she can’t redeem the sluggish, messy Red Sparrow. The movie lacks narrative coherence and becomes a slow, tedious stab at a spy thriller. The Blu-ray boasts very good picture and audio along with a nice roster of supplements. Sparrow squanders its potential and winds up as a forgettable mediocrity.